Vermentino is a light skinned grape most often found in Italy (namely Sardinia and Liguria). Wines made from this grape typically fall into two categories. The first style is light and airy. It has a lean acid profile and is often more floral. On the opposite end of the spectrum, you’ll find a rich and creamy with huge flavors and a more rounded profile. One of the biggest draws of this wine is that is it incredibly food friendly. Leaner styles pair well with seafood and grilled veggies. Creamier styles can easily hold up to pasta dishes with pesto or light cream sauces. For a non-Italian based pairings, try either style with roasted root vegetables or garlicky chicken dishes. It also is enjoyable on its own as you enjoy late summer or early fall days. Most Vermentino is best drunk within a few years of bottling. The freshness of this wine in its youth is vivid and the food friendly acids are more pronounced. As it ages, the floral notes tend to intensify. The bright fruits will mellow and transform into melons or golden apples. White pepper flavors aren’t uncommon either and only intensify the food friendly nature. Although people usually think of Italy when they hear Vermentino, it is also common to other countries as well. The grape can be found in Southern France under the name of Rolle. If you’re a fan of Provence rosé, you may even find some Rolle in the blend to boost acidity and add some floral notes. Clusters of Vermentino grapes on the vine, ripening in the sun. We recently had the opportunity to host a vertical tasting of Vermentino from two different vineyards in the Swan Creek AVA. Raffaldini Vineyards and neighboring Piccione Vineyards both grow the grape and produce a single varietal wine. Raffaldini frequently dries the grapes in a process called appassimento. Drying the grapes removes water from the fruit and results in an intensely flavored wine on the slightly creamy spectrum. Piccione tends to produce a leaner style wine, highlighting fresh fruits with slightly more acidity. We had three vintages from each vineyard and tasted them blind for our guests. Read on for a summary of the tasting notes and for details on each wine. Three vintages of Vermentino from Raffaldini Vineyards. 2014 Vermentino Superiore – ABV 13.5% This vintage had a very floral and fruity nose. Lush lemons and apples dominated the flavors. The creamy mid-palate is complex with white pepper and a mild green finish. 2015 Vermentino Superiore – ABV 13.7% This vintage showed sharper citrus notes with an overall brighter profile. The profile displayed more acidity and brought with it a delicate fruit flavor. Meyer lemons and a slight candied fruit finish made this wine more cheerful. 2016 Vermentino Superiore – ABV 13% This vintage is the current vintage at Raffaldini. The nose is light with a clean lemon aroma. This wine was the freshest tasting and was almost like sucking on a lemon drop with a bright juicy finish. 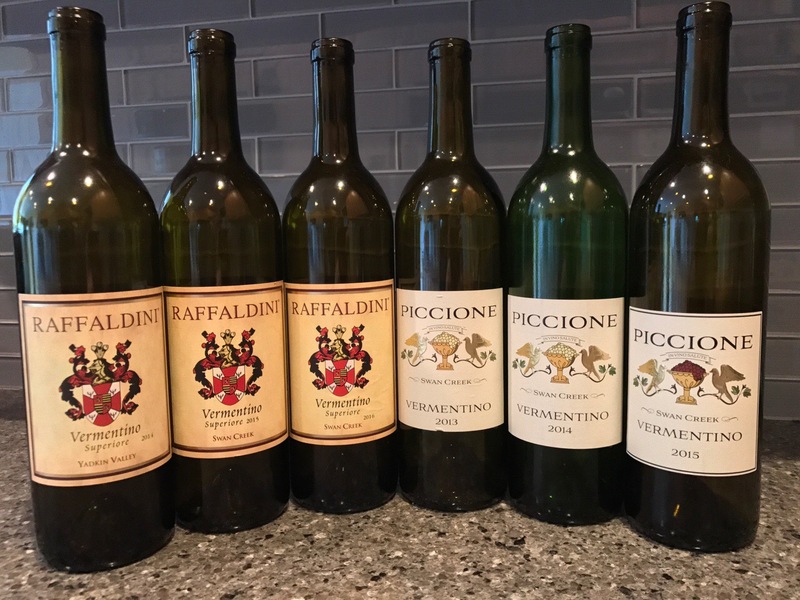 Three vintages of Vermentino from Piccione Vineyards. 2013 Vermentino – ABV 12% This was the oldest of the wines in our tasting. The nose was delicate with a stony, mineral-rich nose. Grapefruit was the predominant flavor with a light and creamy mid-palate. The rich finish hilighted apricots and ended with a very silky texture. 2014 Vermentino – ABV 14.1% The profile of this wine was bigger overall with a more oily texture. The nose was delicate with a musky floral nose. Golden apples and a soft sweet lemon were the primary flavors. The finish was mild with a gentle apricot flavor. 2015 Vermentino – ABV 13.7% A brighter nose and more fruit highlighted this vintage. The apricot and lemon flavors were very well honed and unmistakeable. The creamy mid-palate faded to a white pepper finish. Raffaldini Vineyards and Piccione Vineyards are both located off Cedar Forest Rd in Ronda, NC. Check out our other posts about other Swan Creek Vineyards. Images of grapes provided by Piccione Vineyards.